If you are new to Imagine Español, you'll need to create student accounts. The method you use depends on how many students you need to add, and the Imagine Learning Data Integration team can help with the rostering process. When you are adding fewer than 50 students, you can easily create students individually using the Imagine Learning Portal. This method is ideal for teachers who are creating their own student accounts. Log in to Imagine Learning Portal. On the Dashboard, click Manage Students under the Manage heading, then click Add. Populate the required fields, then click Save Students. See Imagine Learning Portal Help for more information. When you are adding more than 50 students and teachers, accounts and groups can be created in bulk by uploading a spreadsheet directly to Imagine Learning Portal using the Import Wizard. 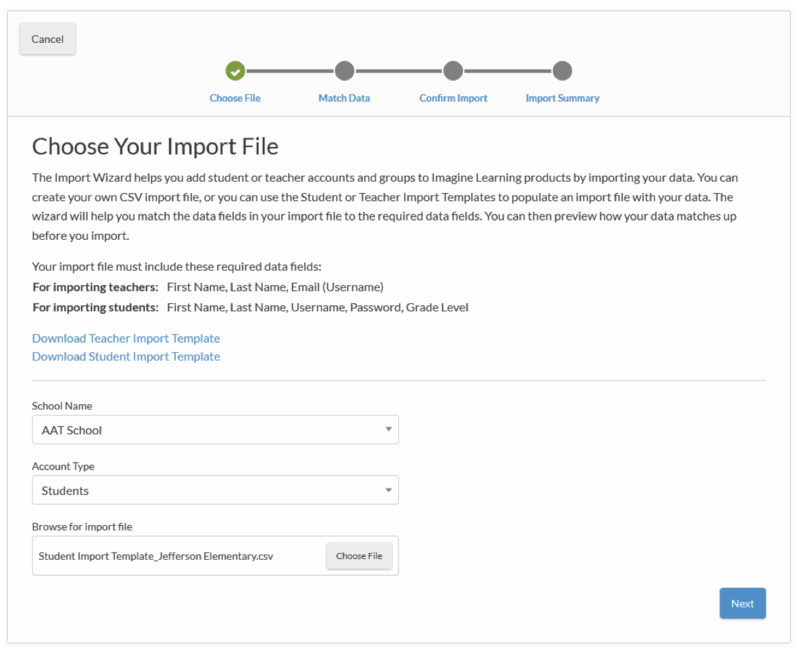 If you are an Administrator, you can use the Import Wizard to create teacher and student accounts; if you are an Instructor, you can create student accounts. Both Administrators and Instructors can use the Import Wizard to create new groups or change which students are assigned to specific groups. Click Import Users in the Quick Start section on your Dashboard or click Import Wizard in the Settings drop-down menu. The Import Wizard guides you through the process of choosing a file, matching, and importing data. See Imagine Learning Portal Help for more information. For large implementations of 200+ students, using import templates to add organizations, groups, students, and users is the best solution. These templates are populated by the school or district from a SIS export, and the templates are imported by Imagine Learning. If you're using this method, you should understand data file management, manipulation, and relationships; be able to extract multiple files from your SIS and provide them to 3rd party application providers or SIS integration services; and be comfortable manipulating rows and columns on comma separated value (CSV) files to accurately represent data relationships. Choose the file templates you'd like to use and click to download the files. Select OneRoster™ templates only if your SIS exports data in OneRoster™ format. Download the import templates you'd like to use and prepare your files. See Imagine Learning file specifications or OneRoster™ 1.1 file specifications for details on populating the import files. Use the secure form to submit your files to the Imagine Learning Data Integration team. 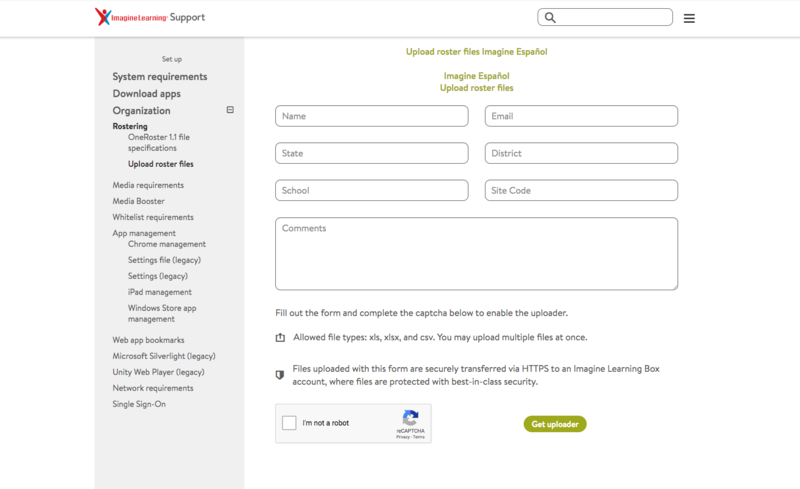 Files uploaded with this form are securely transferred via HTTPS to an Imagine Learning Box account, where files are protected with best-in-class security and accessible to members of the Imagine Learning Data Integration team. Imagine Español can integrate with ClassLink or Clever to load and sync roster data.